Today Every one of us is getting more and more conscious about our fitness. How we are appearing in front of people. Here we are back again with another post to help you out one of most used and most viewed body part, “Arms”. Here we will try to give you very useful ideas about how to rid of flabby arm. Arm flabbiness is caused by an excess of fat, which can be the result of natural changes that occur with age. According to Medlineplus, after the age of 30, body fat has a tendency to increase and lean muscle typically decreases. These changes are partially due to hormonal changes that occur with age, but also because of the tendency to be less active. The hormonal changes cause metabolic rate to decrease, which means fewer calories burned throughout the day. A slower metabolism combined with fewer calories burned from a lack of exercise creates a significant risk of weight gain. Gravitational pull also takes its toll, constantly pulling on the back of the arms and thus facilitating flabbiness. First let’s start with really simple exercise which will get going our blood circulation and start getting up your body warm for upcoming exercise. 1. Raise your hands above your head. 2. Hold your right wrist with your left hand and your left wrist with your right hand, thereby interlocking your hands. 3. Now, with your right hand, pull your left hand towards your right such that your left elbow falls behind your head. 4. Release the tension and take your arms back to the center without releasing your wrists. 5. With your left hand, pull your right hand towards the left such that your right elbow falls behind your head. 6. Again, release the pull and take your hands to the center. Repeat this for at least two sets of 15 repetitions each. Up and twist, will create strain on you triceps muscle, shoulder and it will stretch your waist and back too. 1. Join your hands above your head and lock your hands figure within each-other. 2. Bring your joined hands down to back of your head. 3. Slowly twist yourself to your right and hold position for 10 seconds and come back to your original position. 4. 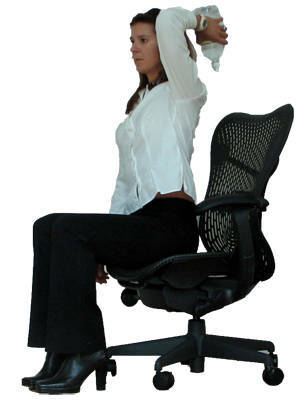 Now, slowly twist yourself to your left and hold position for 10 seconds and come back to your original position. 5. Repeat this for 2 sets of 15 repetitions each. This is yet another classic exercise for arms that is included in most exercise regimes in order to tone and shape the flabby arms. You can do this exercise with or without weights. You can hold two 600 ml water bottles in two hands while doing the arm circles. The backward and forward arm movement tones all the muscles of the arms including the triceps, biceps, shoulders and back muscles as well. 1. Stand with your feet placed shoulder width apart and arms extend straight to your sides, raised at shoulder height. 2. Now, do 50 small circles with your hands by rotating them in the forward direction. 3. Now switch to 50 small backward circles. 1. Place your hands with the palms facing downward on the floor, shoulder width apart, with a slight bend in your arms. Keep your feet together. Support your weight on your hands and toes. You can first start off with knee push-ups and then you can go in for the normal ones. 2. Lower you until your chest is almost touching the floor. Inhale as you do this. 3. Exhale and push your body up back to the first position. 4. Steady yourself at the top and repeat. 5. Do 3 sets of 10 reps every day, to get the best results. This is a very effective muscle building exercise, do try it out. 1. Hold that item with both your hands and lift it over your head. 2. Your arms should be straight, as this is your starting position. Now lower the weight, by taking it behind your back. You need to reach it as low as you can. Make sure that you don’t hurt yourself. 3. Bring up the weight above your head, again. The slower you move your arms, the more toned your arms will get. 4. It is important to keep your upper arms close to your head and ears. Also try to practice this exercise in front of the mirror if you can, it will help you improve the style. 5. You need to do 3 sets of 20 reps, which means you will move the item 60 items above your head. After every set you can take a rest of one minute. Increasing the weight or time after every week will help you to tone your muscles, effectively. If you are working out at home, place your arms on a chair or bench and elevate your feet. This is an effective fat reduce exercise that not only tones the arms, but also the back muscles. For this workout you need to choose a bed or chair, which is a little higher to the ground. Anything that will be stable on the ground is a good choice. A soft cushion sofa may not be the best idea; it will make the toning exercise harder to perform. The furniture should be at least 2 feet higher than the ground. You should have 3 feet of free space in front of the item, to perform this exercise with ease. 1. Assume the starting position i.e. your arms behind your back, gripping a bench or the rack. 2. From the starting position, slowly lower yourself. Keep your body upright and your elbows tucked close to your sides. 3. 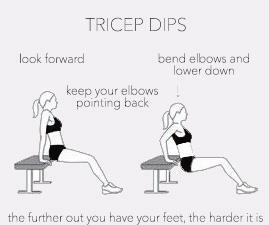 Concentrate on lowering your body only with the triceps. Ensure that your elbows are at a 90-degree angle. 4. After this, push your body back up using only your triceps. Repeat. 5. You need to do 3 sets of 20 reps, every day. This is undoubtedly one of the best exercises to do to lose weight fast. Triceps kickbacks require two light dumbbells. If you don’t have any at home, you can use one-liter water bottles or if you have elastic rope still you can use it. 2. While you are standing, bend your knees slightly, keeping your back straight, and bend forward slightly. Your body should be almost parallel to the floor. Keep your head up and your arms close to your sides such that there is a 90-degree angle between your forearm and upper arm. 3. Keep your shoulders locked to your sides while extending your arms back. Focus on the contraction of your triceps only. 4. Hold for two seconds and lower your arms to the starting position. Avoid swinging your arms. 5. Repeat for 2 sets of 10 repetitions. The movement of this exercise engages the muscles in the back of the shoulder and the back of your arms (triceps). In this position, the triceps kick in to help lift your arm behind your body. 1. Start standing on a resistance band with right foot and hold onto other end with left hand. 2. Stand closer to the handle you're holding for more resistance; further for less. 3. Bend right knee and take a wide step back with left leg, hinging forward slightly from the hips with a straight back. 4. Keeping the arm straight and palm facing behind you, press your arm back toward your hip. Hold for one count, and then lower. 5. Try for 3 sets of 20 reps with each arm before switching sides. These are the best exercises to lose arm fat that you can try out at home. They are really effective and need to be do on a daily basis. You can try all these exercises to lose arm fat or you can select only one. However to lose arm fat faster, you need to use all these exercises. They are aimed at sculpting your arms, so increasing the count of sets every week is essential. Avoid injuries and enjoy a strengthening and refreshing workout at home. Maintain a good diet and focus on the weight loss. Enjoy the benefits of a healthy and happy body. Be Healthy Be Happy and Refreshing..! !